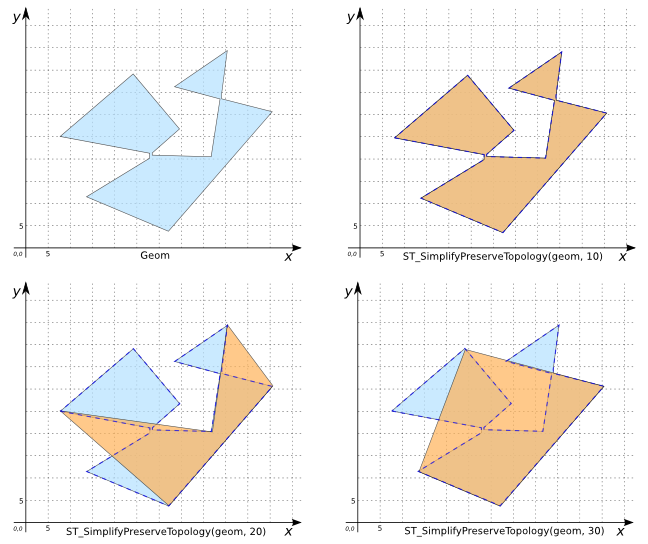 Simplifies geom with a distance tolerance of distance ensuring that the result is a valid geometry (if the input is) having the same dimension and number of components as the input, and with the components having the same topological relationship. Uses a maximum-distance difference algorithm similar to the Douglas-Peuker algorithm. The result rings touch at no more than the number of touching points in the input (although they may touch at fewer points). The key implication of this statement is that if the input is topologically valid, so is the simplified output. For linear geometries, if the input does not contain any intersecting line segments, this property will be preserved in the output. For all geometry types, the result will contain enough vertices to ensure validity. For polygons and closed linear geometries, the result will have at least 4 vertices; for open linestrings the result will have at least 2 vertices. All geometry types are handled. Empty and point geometries are returned unchanged. If a small hole is very near an edge, it is possible for the edge to be moved by a relatively large tolerance value and end up with the hole outside the result shell. Similarly, it is possible for a small polygon component to end up inside a nearby larger polygon. A workaround is to test for this situation in post-processing and remove any invalid holes or polygons. -- The following three examples use the same input POLYGON.